The new edition of this accessible and wide-ranging book demonstrates the distinctive insights that sociology has to bring to the study of globalization. Taking in the cultural, political and economic dimensions of globalization, the book provides a thorough introduction to key debates and critically evaluates the causes and consequences of a globalizing world. Bringing the discussion right up to date, the new edition includes an increased emphasis on the rise of China, the aftermath of the financial crisis and austerity, the benefits of migration and open borders, and the changing structure of global inequality. Data and literature have been updated throughout the book, with new sections on global cities, the environment and international protests, and expanded discussion of gender. 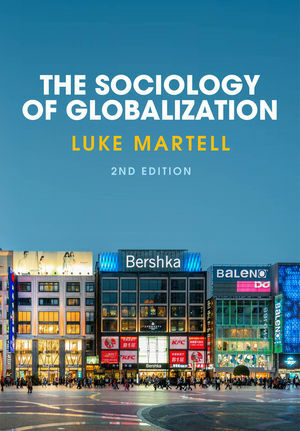 Martell argues that globalization offers many opportunities for greater interaction and participation in societies throughout the world, for instance through the media and migration, but also has dark sides such as conflict, global poverty, climate change and economic insecurity. This book will continue to be an ideal companion to students across the social sciences taking courses that cover globalization, and the sociology of globalization in particular. 1 Perspectives on Globalization: Divergence or Convergence? 2 The History of Globalization: Pre-modern, Modern or Postmodern? 4 The Globalization of Culture: Homogeneous or Hybrid? 6 The Effects of Migration: Is Migration a Problem or a Solution? 8 Global Inequality: Is Globalization a Solution to World Poverty? 9 Politics, the State and Globalization: The End of the Nation-state and Social Democracy? 12 The Future World Order: The Decline of American Power and the Rise of China? -Increased emphasis on key contemporary topics such as the rise of China and developing Asia, TTIP, the aftermath of the financial crisis, refugees and migration and the changing structure of global inequality. -Data and references updated throughout (including to topical references such as social media and smartphone usage). -Expanded sections on scholarly work on important topics such as gender inequality, the environment, and global cities. -Generally improved writing style to ensure absolute clarity and accessibility for students.